Home Blog What is the best way to learn Chinese online? What is the best way to learn Chinese online? So you finally decided that you are ready to learn Chinese!!! You finally overcame your fear and didn’t listen to the silly rumors that Chinese is so difficult! You finally overcame your anxiety about pronunciation and are ready to take a bold step to diving into the language! Are you excited? Well here’s something that can make you even more excited! Nowadays, learning Chinese is so much easier and faster thanks to modern technology! You don’t have to spend hours with a dictionary learning the sounds and letters. Now before I tell you which top Websites are the best way to learn Chinese online; I have to first explain to you what to look for: first you must pick the website that is entertaining and fun. The last thing you want to do once you convinced yourself to learn another language is to pick a site with a boring teaching method. However, at the same time make sure that the website is effective in that it breaks down the pronunciation aspect of the language and the meaning. Make sure that the site has clear leaning goals and objectives. Websites that have clear list of goals pertaining to language learning, are able to attract more customers and most likely have higher traffic. In addition make sure that the website matches the needs of your budget. There is a lot of competition out there to try to capture the customer. So there are a lot of options to choose from! Number One: If you want a site to help improve your reading skills then The Chairman’s Bao is just the site for you. It is an online interactive newspaper written in Mandarin. you of the best features of this website is that you can highlight a word and the definition will appear to the right of the text. If you are able to master reading a second language in the high level vocabulary that most newspapers are written in, then that means your language level is high. Oh! I forgot to mention that Mandarin is the main ethnic language spoken in China out of the 8 major languages. So once you are fluent in Mandarin you will be able to communicate with at least 90 percent of China’s population. Most Chinese do not speak English so Mandarin is your gateway to navigating your way, if you plan to visit China. The next website that I highly recommend is Fluent U. Fluent U is the best website for someone who is a visual learner. Fluent U is designed to help you emerge into the Chinese culture through a variety of mediums. First it has interactive videos of Native Mandarin speakers, so this helps you to improve your accent. Then it takes the vocabulary that you learned and turns each lesson into games, quizzes, TV shows and commercials. This gives you a full real life experience, so you can see how Mandarin is used in different context! It also has videos that allow you to tap on the word and look up the definition. You can also navigate through the different levels and challenge yourself as you improve in all four skills: reading, writing, listening and speaking. So Fluent U is the best website to learn Mandarin and have fun at the same time. 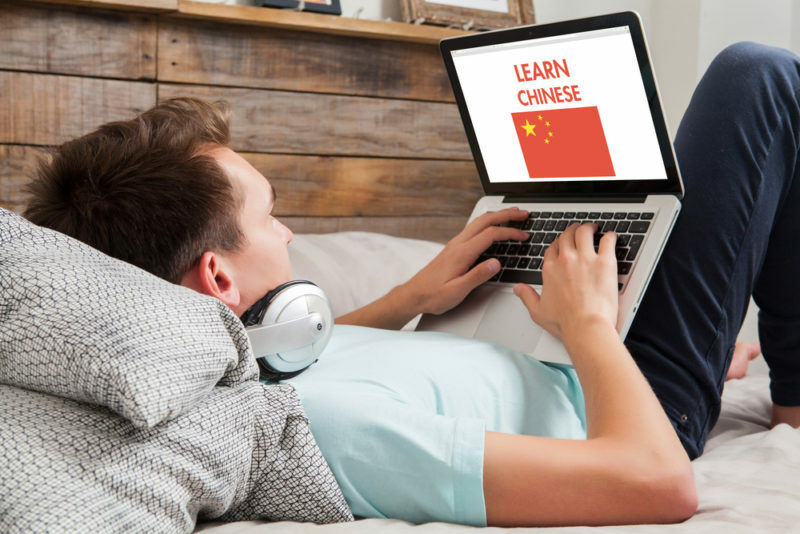 Are you still pondering over the best way to learn Chinese online? Well here’s another great option! Chinese Voices! Chinese Voices is a website that offers many podcasts pre-recorded by native speakers in Bejing. So this is the perfect way to improve your listening skills on your way to work in the morning! Chinese Voices is specifically designed for second speakers of Mandarin so the podcasts are slow enough for you to hear the pronunciation of the words. This online platform is also an excellent way to learn about the everyday life in Bejing. Most of the podcast discuss real life issues and challenges that locals face living in a busy city like Bejing. So if you are planning to travel to Bejing you will already have some idea about what to expect. Another excellent website is YellowBridge Dictionary. This website is specifically designed to help you look up characters, and hear how they are pronounced. It even has a built in stroke order animation so that you can slowly see how the character is written. You can also use a thesaurus to look up words or characters with similar meanings, or to get a full definition of that character or word. Another excellent website is called Rocket Languages. Rocket Languages ,is a comprehensive learning website that has a variety of audio lessons. This helps you with pronunciation in that it allows you to prepare to have real live conversations with native Chinese speakers. This is a good website that allows you to listen while doing other tasks around the house. It’s main objective is to help you to improve your accent to graduate towards native speaking level. If you are the artist type, and love calligraphy and the art of the Chinese language then Arch Chinese is just the site for you. It is a site designed to help you to improve our ability to write Chinese characters and help you master the proper stroke order. On this site are generated ready-made vocabulary lists, so you can learn how to write the main words you need. Arch Chinese also has an app that allows you practice the different tones paired with different character words. Last but not least is the Chengyu story database. Chengyu are Chinese idioms that are based on stories. Now as you know English idioms to second language learners of English can be challenging and confusing. Well this website helps you to understand how the idioms are used in the cultural context of a Chinese story. The database also is equipped with pictures to help you grasp the concept of the idiom according to its cultural context. It also comes with English definitions. So as you can see there’s so many options to choose from! There’s no reason for you to worry about improving your Mandarin skills. With all of these wonderful options,soon you will be on your way to China!!! Now with all of these options you don’t have to ask yourself- what is the best way to learn Chinese online?